The Edelstein Bros., pawnbrokers, moved to this building on East 14th St. in 1945. Previously they were located on 1st Ave. near 15th St. The brothers were Isaac Edelstein (1876-?) and Max Edelstein (1893-1974). They inherited their pawnshop business from their father Simon Edelstein (1854-? ), an immigrant from Russia in 1875. Simon Edelstein is listed in the US Census of 1900 living at 81 Borden Ave., Long Island City, Queens, with his wife Toba and the 7 living children born to the couple. Among the children are Isaac, age 25, and Max, age 6. Both brothers registered for the World War I draft while employed by their father in the family pawnshop at 252 1st Ave. Max registered in 1917, Isaac in 1918. A third brother, Goodman Edelstein (1880-?) opened his own pawnshop, G. Edelstein & Co., on 3rd Ave. near 145th St. in the Bronx. 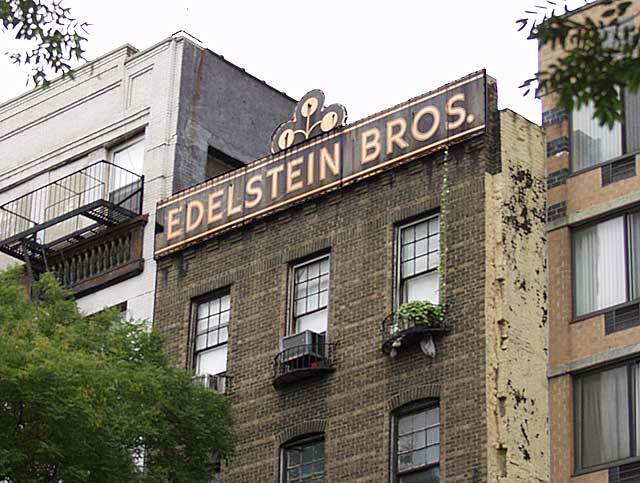 Edelstein Bros. remained at this location on 14th St. until 1981.